Commencement Walk is now complete! Please take a stroll and enjoy the new gathering places and views! As part of the process of installing Commencement Walk in concert with the overall master plan for campus development, we will be attending to drainage, electrical, and other issues that require attention. As a result, we will experience planned power outages beginning Monday, June 6, and concluding by the end of the day on Friday, June 10. Areas affected by power shutdowns are listed below. Please note that emergency generators will be provided from 6 a.m. to 9 p.m. for Memorial Fieldhouse, Warner Gym (offices only), Wyatt Hall (classrooms only), and some parts of Facilities Services. Faculty and staff in affected areas should shut down computers and other sensitive electronic equipment prior to leaving campus for the weekend. If you feel more secure unplugging, please do so. Thank you for your patience as we work together to enhance our campus! Monday - Friday, 6 a.m. - 9 p.m. The second phase of Commencement Walk is underway, with construction crews mobilizing, performing site surveys and utility locates, and installing construction fencing around the worksite. In the coming days, crews will continue to install construction fencing and temporary pathways, start demolition activities, and take precautions to protect the trees that lie within the construction zone. As with every construction project on campus, we take special care to maintain the health of the trees that are such a vital part of campus. Working with an arborist, we have identified several trees that will be impacted by the project and need to be moved or removed. These include the diseased pine and spruce trees near Warner Gym and South Hall, which will be removed and replaced with two 6" caliper, 25 to 30-foot-tall Autumn Blaze maple trees in front of Warner. The large maple trees are better suited for this environment and will fare better than the pines and spruces. Unfortunately, the paulownia (empress) tree in Karlen Quad must also be removed to allow Commencement Walk to be installed between the Color Post and the Library. This species is considered to be a "weed" tree and is not a candidate for re-planting elsewhere on campus. A firm specializing in tree moving will relocate several dedicated trees that will be impacted by Commencement Walk to appropriate new homes on campus, so that we may continue to recognize those in whose honor the trees were planted. The construction zone will be completely fenced off by Monday, May 23. Please consult the Summer Construction Mapto identify alternate pathways and building entrances. If you would like more information about this work, please contact Feather Billings. Work on Commencement Walk has already begun on the south end of campus. The first phase will be completed in time for Commencement weekend. The remainder of the walk will be completed before convocation in August. After Commencement, Karlen Quad will be closed and alternate pathways will be in place. Look for signage and more information coming soon. Portions of this project will be loud, especially in the beginning, but we are working closely with colleagues in Jones Hall, the Library, and the Music Building, in particular, to minimize disruption during this period. Wallace Pool hours may also be affected by the construction schedule. Please note that crews will be working on the walk Mondays – Fridays, 7 a.m. – 5 p.m., with longer shifts and Saturday work as needed. The Center is scheduled to be completed in June, with faculty and staff move-in to follow. Faculty directors, fieldwork coordinators, and OT/PT staff members from South Hall will be temporarily relocated (through mid-June) in Warner Gym and other locations. South Hall is scheduled to come down during the first two weeks of June, and the South Hall parking lot will be closed through the middle of August. Cosmetic renovations to the Wheelock Student Center main entrance, lobby, and Rotunda will begin in early June, including painting, carpeting, work on the ceiling, and a relocated and improved Information Center. 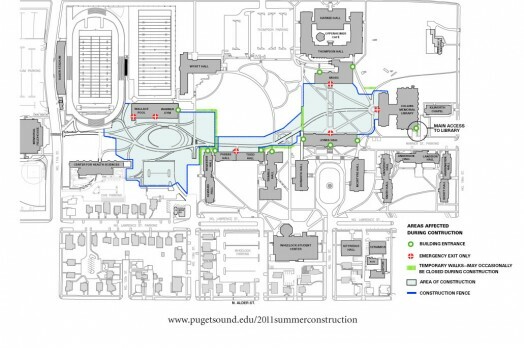 Plans call for the most disruptive portions of the work to be completed in the evenings to avoid inconveniencing conference guests and provide uninterrupted access to dining services. Information will be posted regarding alternate entrances to Wheelock as needed. Work will be completed on the library elevator and adjacent lobby areas beginning in mid-May and concluding mid-August. The existing elevators that serve the north section of the library will be operational during the project. After members of the psychology department relocate to the Center for Health Sciences, a portion of the lower level of Howarth Hall will be reconfigured for Human Resources, placing them in close proximity to Career and Employment Services. Human Resources staff will relocate to Howarth in August. The Lawrence Avenue house vacated by Human Resources will be used for temporary administrative purposes. Routine maintenance on Puget Sound’s electrical feeders will result in temporary, planned power outages affecting some of our campus residential and academic facilities. Occupants of affected buildings will be contacted well in advance of planned outages. Generators will be utilized wherever possible to provide emergency power during the outages.